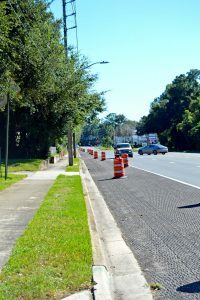 Hendricks repaving to finish by year’s end - The Resident Community News Group, Inc. | The Resident Community News Group, Inc.
Construction continues on Hendricks Avenue in San Marco as the Florida Department of Transportation work to resurface the road and stripe bike lanes in both directions. The end is near for the Florida Department of Transportation’s Hendricks Avenue (State Road 13) resurfacing project. Weather and schedule permitting, the contractor began the final paving course on the main roadway during the week of Oct. 15, said Sara Pleasants, public information officer for FDOT. “Once paving is completed, the roadway will be striped in its final configuration, and on-street parking will again be available between Peachtree Circle North and Dunsford Road,” she said, adding that construction is expected to be finished by the end of the year, pending weather or any unforeseen delays. The $5.4 million project has been in the works since early January 2018. It consists of resurfacing and making safety improvements along a three-mile stretch from Cornell Road to San Marco Boulevard. In addition to removing and replacing the top layer of asphalt, the project includes pedestrian, bicycle, and traffic safety improvements at Arcadia Drive and sight-distance improvements at San Jose Boulevard South. As part of the project, the intersection of Old San Jose Boulevard and Hendricks at the Miramar Plaza was re-designed to for additional safety. Prior to the change it was often dicey when cars traveling south on Hendricks attempted to access residential streets south of the intersection while those merging onto Hendricks southbound from Old San Jose were accelerating. Also new is the elimination of the dedicated right turn on to Mitchell Street from Hendricks’ northbound lanes. In addition, crosswalks are being restriped at several intersections and pedestrian signals are to be installed at Greenridge Road, Emerson Street, Ridgeland Road, Dunsford Road and River Oaks Road. The crosswalk and pedestrian signals were also slated to be updated at Hendricks Avenue Elementary School, and a pedestrian island is to be constructed in the school zone. Bicyclists should be happy that both sides of the road will be striped with bike lanes and on-street parking will be removed with the exception of a small commercial stretch between Peachtree Circle North and Dunsford Road, where street parking will remain. In that small area, the roadway will be widened by narrowing the median so that both bike lanes and parking can co-exist.